For the KWVR, 2018 will be a year to celebrate. It marks a significant milestone the 50th year since the railway reopened to passenger operations as a preserved line. To make 2018 a ‘double celebration’ year, the Ivatt tank, once a common site on our branch line in BR days, will again be back in steam. 41241 was one of the locomotives that pulled the KWVR line Re-opening Special back in 1968 and will take part in the 50th anniversary celebrations. Putting the Ivatt back into steam however comes at a cost, £200,000 and with a 2018 deadline this adds significant time pressure. The clock is ticking, work is already well underway and the bills are starting to come in. 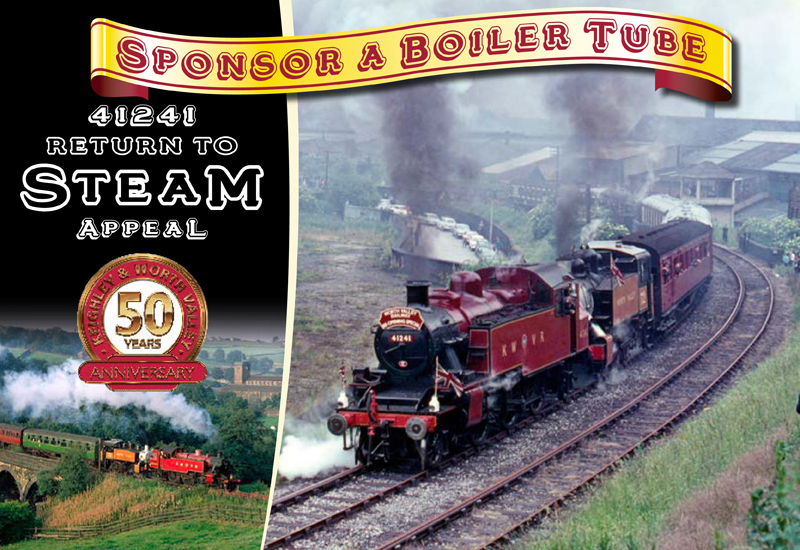 Just two weeks ago the railway launched the first stage of a fundraising programme for 41241 – ‘Sponsor a Boiler Tube Appeal’ – to our membership. This appeal has had a great response from our membership and has raised £9,750 in sponsorship and donations, with Gift Aid worth adding an additional £1,500. We have more than 54% of the boiler tubes now allocated to sponsor’s and there are only 5 of the large boiler tubes available. This appeal is open to all who wish to see 41241 back in steam in her natural environment. Follow the link to visit the 41241 Ivatt – Appeal for more details and to download the Ivatt Appeal sponsorship . But do not delay if you wish to be one of the Ivatt’s boiler tube sponsors. Complete the sponsorship form and send it with your donation cheque as soon as possible. Best wishes from the 41241 Ivatt Appeal team.